Acquiring money in a way that involves no face-to-face human interaction is my main passion in life, and I think there are some great betting opportunities on UFC 236. Here are my breakdowns of the fights I have action on. Entering his athletic prime at 28-years-of-age, Alexandre Pantoja is a jiu-jitsu black belt with solid kickboxing. Training out of American Top Team, Pantoja has world class coaching at his disposal as well as an abundance of high level sparring partners at the lighter weight classes. It’s evident Pantoja will have an advantage on the feet, so I assume his plan will be to stuff takedowns, create separation and unload at kickboxing range. While Pantoja is a well-rounded fighter, I don’t think he’s the strongest wrestler – and this could be an interesting factor in this match-up. Former title challenger, Wilson Reis, has never been an elite striker. While he utilizes upper body movement well and is light on his feet, the accuracy on his punches is dreadful. He throws a lot of volume, but you often see his strikes land and inch or two in front of the intended target. If he gets stuck at distance, he’s getting lit up. Like Pantoja, Wilson Reis is a jiu-jitsu black belt – but he also possesses a solid offensive wrestling game. He has good entries into his takedowns, chains attempts well and can hit a good reactive shot (Pantoja doesn’t mind planting his feet and swinging like a maniac). In a grappling battle between two black belts under MMA rules, its feasible Reis could win rounds with positional control as he’ll be the one in the dominant position after scoring a takedown (Pantoja rarely shoots). Reis also has the ability to run down the clock by holding Pantoja against the fence and blasting him with knees. One disadvantage for Reis is that he’s 34-years-of-age and looked somewhat sluggish in his last contest. This is often the age that fighters start to decline, so it wouldn’t surprise me if he gets old overnight. I’m not a clairvoyant, I don’t know who is going to win this fight – both combatants have clear paths to victory. With that being said, I believe this fight should be lined closer to a pick ‘em, so I had no problem taking the value on Wilson Reis at +175. Alan Jouban might be a male model, but he doesn’t fight like one. Coming from a muay thai background, Jouban is an aggressive southpaw striker with smooth straight punches and powerful kicks to the legs, body and head. As you’d imagine, he’s also a savage in the clinch with his knees and elbows. Despite his striking credentials, Jouban is also a jiu-jitsu brown belt under Eddie Bravo – although I don’t think we’ll see too much grappling in this contest. While he’s an excellent athlete, Jouban is now 37-years-of-age and has some serious mileage on his body. He’s been rocked or knocked out on numerous occasions and there are big questions about his chin – particularly since he’s facing a puncher in Dwight Grant. Despite fighting out of an elite gym in AKA, I’m not overly impressed by Grant’s technical ability. At 34-years-of-age, I don’t know how much he’s going to improve either. Primarily a striker, Grant loads up a lot and wings shots – which can work against a certain level of competition, but I’m not sure if it will here. Technique for technique, it’s obvious Jouban has the advantage. The issue for him is that when he starts to establish an offensive rhythm, he tends to throw caution to the wind defensively – which could leave him open to a precision death blow from the AKA fighter. Jouban may very well get knocked out, but we’re looking at ‘pick em odds here. When the lines are this close, I’ll always take the technician over the puncher. I have 2 units on Alan Jouban at -110. A powerful southpaw striker, Khalil Rountree isn’t the most balanced fighter in terms of skills or athleticism. While he can annihilate any opponent with one shot, his gas tank drains quickly after a flurry of punches. Rountree seems like a fast twitch, explosive fighter that hasn’t worked out how to manage his energy in a way that suits his body type. While dangerous and reasonably technical on the feet (while he’s fresh, at least), Rountree is not a good grappler. I have serious reservations about his takedown defense and especially his ground game. In the third round against Michał Oleksiejczuk, Rountree was visibly exhausted and offering very little off his back. If he gets taken down by Eryk Anders in rounds two or three, I question whether he’ll be able to work his way back to his feet. Also a southpaw, Anders keeps his left hand cocked and stalks opponents down before unloading. He could do a better job of cutting off the octagon, as we saw in his last contest against an elusive Canadian with girly hair, but he won’t have to go searching for Rountree in the cage. Much like Rountree, Anders packs a punch. However, his explosiveness doesn’t come at such a horrendous cost to his gas tank. Against Thiago Santos on short notice, Anders pushed a crazy pace and showed he has a serviceable grappling game to compliment his striking. Even in defeat, Anders performed admirably. Anders is training at Factory X for this camp, so I wouldn’t be surprised if he shows some improvements. Make no mistake, there is a very real chance Anders gets starched in round one. If that doesn’t happen, I think he’ll take over – especially if he adopts a grappling heavy approach. I have some action on Eryk Anders at -160, which I believe was a great price. Honestly, I think there is still value at -190 as I would cap him around -250. In Robert Whittaker’s absence, Kelvin Gastelum and Israel Adesanya lock horns in a five round title fight for supremacy over the middleweight division. Seeing the two athletes next to each other, the difference in body types is extreme. Standing 5’9 with a 71-inch reach, Kelvin Gastelum’s body type is arguably more suited to welterweight. Conversely, Israel Adesanya stands 6’3 and possesses an 80-inch reach (I believe this is the longest wingspan in the division). Unlike some of the lanky, malcoordinated fighters we’re familiar with, Adesanya knows how to use his reach effectively. With a great jab, fantastic footwork and effortless stance switches, the Nigerian is one of the best outside fighters in the UFC. He has an abundance of offensive tools and it’s hard to envision him losing rounds as long as the fight stays standing. Knowing that everyone is going to want to take him down, Adesanya seems to have worked tirelessly on his takedown defense and get ups. Some may argue Gastelum can wrestle his way to victory and perhaps sink in a rear-naked choke, but based on the footage available – I’m far from convinced. Although he comes from a wrestling background and is a jiu-jitsu black belt, Gastelum is primarily known as a boxing-centric striker. Light on his feet, Gastelum closes the distance quickly in order to land his big left hand. While the Kings MMA fighter has a great 1-2, he’s nowhere as dynamic as his opponent. I believe Gastelum’s most likely path to victory is a knockout, but he’ll need to be at point blank range due to the height difference. Someone as defensively savvy as Adesanya is going to see that coming, in my opinion. I have some action on Israel Adesanya at -165 and I think I got a great price. I also believe there is value on Adesanya by decision at +210. 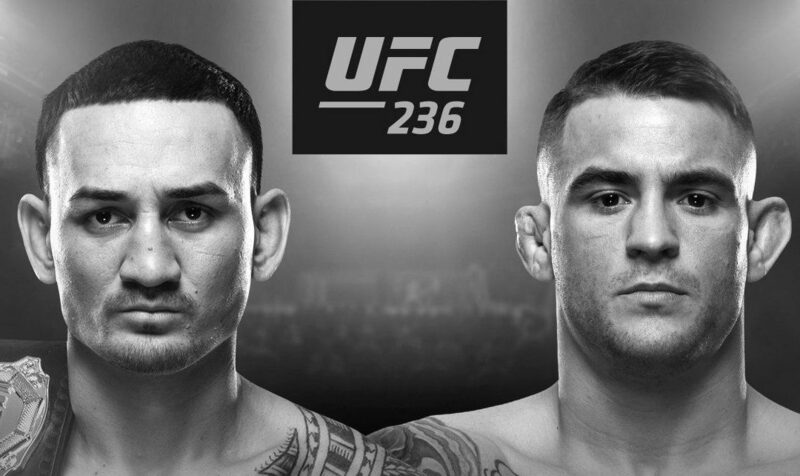 While Max Holloway and Dustin Poirier faced off in the featherweight division many years ago, both fighters have evolved exponentially since then. Although Holloway will be moving up to lightweight for this five round battle, he won’t be undersized. Fighting out of American Top Team, Dustin Poirier is laser-focused on becoming a world champion. A deadly southpaw, Poirier has clean boxing and underrated low kicks. He also packs a serious punch, flattening the likes of Diego Ferreira, Bobby Green and Eddie Alvarez. Not the most defensively minded fighter, Poirier will go to his wrestling when he starts absorbing too many strikes – as was the case against Irish boxing stylist, Joe Duffy. Poirier is a proficient MMA grappler and could have a significant advantage if he’s able to maintain top position. This is easier said than done against Max Holloway, who has looked excellent at defending takedowns and getting back up to his feet (against featherweight opponents, at least). An attritive volume boxer, Holloway breaks opponents down before finishing them. With awe-inspiring slips, footwork and punching combinations, Holloway is a pleasure to watch. Although he has a granite chin, Holloway does get tagged up – and this could potentially be a problem against a puncher like Poirier. I favor Max Holloway to win this fight due to his phenomenal pace and striking style, but I don’t think there is much (if any) value at -210 so I would pass on betting. Download my Top Secret Live Betting Guide (non-virgins only).